Mr. Clean may not be down with dirt, but he’s definitely able to get down and dirty on the dance floor. Turn on some old-school R&B, hand him a trusty magic eraser and he will not only leave your surfaces absolutely spotless but also … seduce you? That’s how things unfold in the brand’s first Super Bowl ad, created by Leo Burnett Toronto. The 30-second spot will run during the third quarter of the game. The ad opens on Sarah, a regular woman just hanging out in her kitchen. She sees a stain and sighs, probably because the last thing she wants to do is scrub food remnants from her stove top. But when Mr. Clean saunters onto the scene, while suggestively squeezing a magic eraser, her expression changes and things start to get very uncomfortable. Aside from his incredible cleaning abilities, it appears Mr. Clean also has Magic Mike-level moves. As the spot unfolds it turns out Mr. Clean isn’t really there at all, just in spirit, and instead Sarah’s partner is keeping the house clean. “You gotta love a man who cleans,” the tagline reads, and judging by Sarah’s reaction she clearly does love a man who can keep the house tidy. 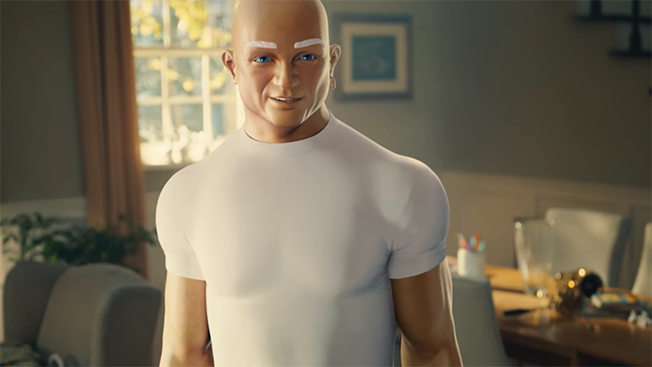 It may seem odd to sexualize a CGI mascot that’s clearly meant to target a more adult female audience, but Mr. Clean isn’t the only brand to do so. Green Giant recently reintroduced its jolly mascot with a similar scene between the giant and a woman closely observing him from her car. Last year the Procter and Gamble brand kicked off a search for a new Mr. Clean mascot with a campaign starring actor Kellan Lutz. Mr. Clean announced the winner of its competition, a man from Georgia named Mike Jackson, earlier this week but for Super Bowl LI the iconic mascot (in CGI form) will take center stage.